Orson Welles, Alfred Hitchcock: two famed directors, and they both had anthology shows collecting thrillers and horrors in compact packages for the viewing public. Alfred Hitchcock Presents was considerably more famous, but there are those with fond memories of Welles' 1973-4 excursion into the same territory, though in his case all he really had to do was spend an afternoon filming a few intros and outros and pocket the cash for his rarely-realised pet projects. But heralded by John Barry's distinctive theme tune over opening titles that showed Welles wandering the streets at night, it certainly sounded as if he had made an effort to at least pen his own material, being familiar with the classic tales from literature being adapted. In A Terribly Strange Bed, a Wilkie Collins story was the focus, he the writer of one of the greatest suspense novels of all time in The Woman in White, and though this was a more modest affair, it was no less ingenious. Orson regales us with his impressions of Paris, the Paris of yesteryear where this is set, before we launch into watching Edward Albert and Colin Baker (he of future Doctor Who fame) at the roulette table in a "slum" area of the city, and winning big. Colin doesn't like the look of the place, but Edward is dazzled by his earnings, and is soon left alone where local rogue Rupert Davies promises to take care of him, even giving him a bed for the night. Rupert won't hold him tight, but the bed surely will in a smart, novelty-flavoured anecdote. An O. Henry seasonal yarn is next, Henry having the benefit of his own anthology movies earlier in the century, though he is not as famous as he used to be. He was a master of the ironic story of the kind that was very popular way back in the nineteenth century, and Compliments of the Season has a rag doll lost by a spoilt little girl when unbeknownst to anyone in her mansion home, the pet dog has lifted it and buried it outside. Somehow this gets to drunkard Eli Wallach, who uses the toy to secure festive drinks, but two ne'erdowells are watching, and have seen the £25 reward offered in the newspaper for its safe return. The question is, how can Eli get the reward without also getting a knife in the ribs? The answer was a shade unlikely, but it was amusing (i.e. hammily) played. The Ingenious Reporter sees us back in Paris, giving Orson the opportunity to wax lyrical through his cigar smoke once again, drawn from a short by French author Pontsevrez, telling of David Birney as the titular journalist who believes he has hit upon a terrific scheme to get his paper a real scoop on who has killed a murder victim recently found in the city. He will frame himself as the villain, then when he has enough information for his report will admit he made it all up and reap the financial and career rewards. The only trouble with that is, his girlfriend has gone missing, which leads us and the authorities to wonder how far he is telling the truth, and the whole thing turns into a dramatic, bleak little comeuppance for one man's hubris that goes far further than is fair. The series included one of the most celebrated short horror stories of all time with W.W. Jacobs' The Monkey’s Paw, adapted countless times for the stage and screen, and indeed Megs Jenkins, who played the mother in this version, had already played the same role in a 1948 quota quickie. The source went on to inspire one of Stephen King's grimmest novels Pet Sematary, but there was something about the chilly simplicity, the harsh logic, of the original that made it so effective, even if there was no need for special effects or gruesome makeup. If you don't know, the paw has magical powers in that you can make three wishes with it: but those wishes come with a terrible price. Cyril Cusack played the father, Michael Kitchen the son, and Patrick Magee the owner of the paw. Contrary to popular belief, Jacobs did write other fiction, and Captain Rogers was one of those, here adapted to the talents of Donald Pleasence and Joseph O'Conor. O'Conor played Captain Mullet, a respectable figure in this Southern English county, who is alarmed to see Pleasence arrive at his house one night with an ultimatum: admit he is Rogers, or this visitor will spill the beans about his true identity. But is Mullet who this stranger claims he is? His daughter (Janet Key) cannot believe her father would ever have been a bloodthirsty pirate, but if he was, the ragged newcomer better watch out lest he resort to his old, ruthless ways. This was really a showcase for Pleasence's ripe performance, and if you were a connoisseur of such things you would find much to enjoy. This was not a series that stayed exclusively in the past, for as with the adaptation of The Monkey's Paw, there were a few contemporary settings too (for the early seventies). For Sale - Silence was one of those, based in a world of espionage that has not been implemented for nation spying on nation, but for the grubbier scenario of a weaselly blackmailer (Ed Devereaux) using technology to record illicit meetings in a hotel room. However, he doesn't reckon with the old adage about building a better mousetrap, and soon he tangles with a better mouse in the shape of businessman Jack Cassidy. We can tell this man is a cut above because he has a computer in his office: not a laptop, one the size of a bureau, so it is amusing to see who gains the upper hand. Honore de Balzac's La Grande Breteche saw the series on firmer ground and it seemed more comfortable in the past, and this plot with its Spanish military prisoner sneaking off every night to visit Susannah York, the wife of Peter Cushing's French Count, was generally regarded as one of the best, if not the best, of the entire run. A lot of that was down to Cushing, who was a master at icy villainy and here was about as cruel as you could ever imagine, banking on his wife not owning up to her affair to inflict a terrible revenge on both her and her lover (Marc Zuber) who when he deliberately returns early one evening, is concealed in her closet. The horrible inevitability of the end result was extremely memorable, thanks to de Balzac's writing and a perfect role for the star. F. Britten Austin is not as well-known a name as Balzac, but he was pretty industrious as a writer in the first half of the twentieth century, often with the subject of war. It was the British Empire that held his attention for An Affair of Honour, an espionage item where General Harry Andrews assigns a couple of Majors, Jeremy Clyde and Michael Gambon, to uncover a spy in their midst who has photographed vital plans. Although Welles gave away the ending more or less in his introduction, we were treated to a great big punch-up in the second part as the officers grapple for supremacy, and Jenny Hanley was on hand as a smart cookie who works out where the problems lay. This already felt like a throwback to an earlier genre of entertainment, but was fair for all that. In the Confessional was an adaptation of the first of Alice Scanlan Reach's Father Crumlish stories, here with the priest played by Milo O'Shea. However, in this telling he was not the main character as that went to José Ferrer, who played one of those roguish old tramps, called Old Harry in this case, who populated many a tale of this sort, often receiving some form of comeuppance in the process. His crime is stealing coins from the collection box to pay for bottles of whiskey, but the retribution involves overhearing a confession from a young man (Phil Davis) who may have murdered a teenage girl (Julie Dawn Cole in a nightmare sequence) in the area. Shane Rimmer also appeared as a policeman who enters the story to give it its heavily ironic capper. We returned to the stories of O. Henry for The Furnished Room, a bleak account of a man searching for his lost partner who he is tracing through the most impoverished boarding houses he can find, not knowing if she is still alive or has maybe even killed herself. Clarence Williams III played the seeker, taking a break from episodes of The Mod Squad, and Irene Worth played the landlady who is not giving anything away for reasons best known to herself. A moody, depressive little piece, Williams seemed to be on his own path to doom from the outset, and while he conveyed a haunted quality all too appropriate to the role, it was not much fun to watch his decline: considering these episodes went out on a Saturday night, this would be a real downer for the end of the evening. Off to a police state, unnamed in this case, for Under Suspicion, a generic title that concealed a story of political pressure mixing with affairs of the heart. Janice Rule played a concert pianist who has had some trouble with governments before, rendering her effectively stateless though she does have a passport which is taken away by Kenneth Haigh, a representative of the regime who wish her to spy for them (yes, more spying - it was a bit of a theme). The man she is supposed to keep tabs on is Dinsdale Landen, her lover who she believes she is destined to spend the rest of her life with; can you hear the ironic laughter as those plans swiftly fall apart? Rule got to mime to the piano in her apartment for much musical emoting as the angst got to her, in a heartless little entry. Sir Arthur Conan Doyle was adapted for The Leather Funnel, a yarn designed to get under the skin, with its events here updated to Paris in 1974. Simon Ward was the innocent accountant who has agreed to meet his girlfriend at the apartment of her uncle Christopher Lee, and notes the place is festooned with artefacts and objets d'art, one of which is that funnel which intrigues him as he cannot understand what it was used for. He finds out after a fashion when his drink is spiked and he's sent into a hallucinatory nightmare, revealing the funnel was a torture device (how, we are not told) that killed a murderess (Jane Seymour) in a torture chamber centuries ago. Hence unexpected consequences for his plans to ask his girlfriend to marry him in a pointedly uneasy, creepy episode. Another great British writer of yesteryear saw his work brought to the small screen with Trial for Murder, the rather nondescript title of one of Charles Dickens' ghost stories (this one co-written). Rather than the improving spirits of A Christmas Carol, the ghosts here were more ambiguous as a man in custody (Keith Buckley) on a murder charge is visited by visions of a man holding a noose. We know the man he sees is not dead, but soon to be the foreman of the jury in the accused's trial, played by Ian Holm, who witnesses a spectre himself, that of the murdered man - but was he murdered at all? Is this some form of vengeance from beyond the grave, and if so, what was the motive? Effectively a courtroom drama with a twist, this had neat, stuffy acting from Holm. 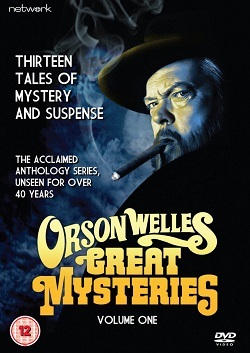 That's it for Volume One of Orson Welles Great Mysteries (note: no apostrophe in that title), a diverting collection of tales from Anglia Television, and now on DVD from Network. Click here to buy from the Network website.